It seems like it would be fairly difficult to cheat in a cross country or track race. There’s little gamesmanship in foot racing. You show up, you run for the allotted distance, and you finish. It’s a punishingly simple sport, and unless you are doping, cheating is sort of impossible. Which is all to say, I’m impressed by the audacity with which a New Jersey high school senior dubbed the Manhattan Bandit appears to have cheated several races in his high school career. MileSplit reported this weekend that the Bandit jumped the course at the NXN Northeast boys championship race and improved his career-best time in the 5k by almost two and a half minutes. They reviewed race photos and confirmed with race organizers that the Bandit had no split time, taken at the halfway point of the race. It’s possible that the runner missed the checkpoint, but a LetsRun user claims to have run in the same race and said that missing the time check would have been impossible. A Reddit user also said he did not see him anywhere in the race. This is nothing new for the Bandit. MileSplit also published photos of him at October’s Manhattan Invite (where he earned his moniker, which I will keep using since he’s a high school student and it’s a cool nickname) in which he appears to stand next to the oncoming race, then jump back in after the leaders. 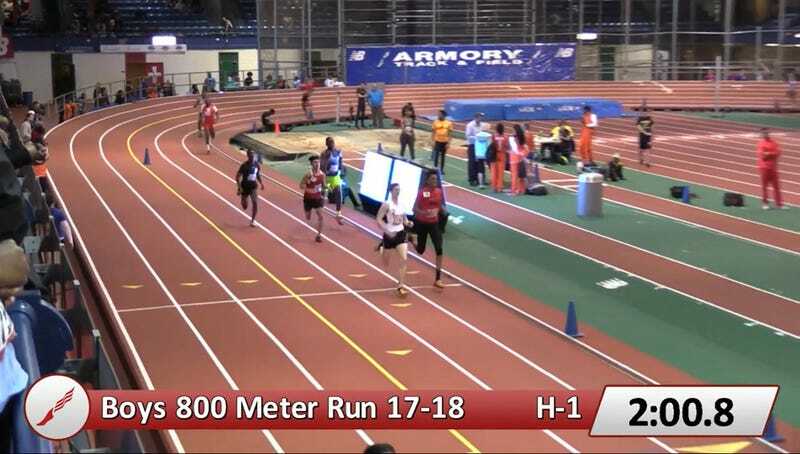 Stranger still is this video from an 800 meter indoor race this winter. You can see the runner, wearing number 11, drop out of the race at about the 500-meter mark (1:13 in the video) then join back in at a jog on the back straight (1:55 in the video) and finish third. That he’s gone this long without getting caught is miraculous. It’s one thing to jump in and out of a mass-entry cross country race, but to cut off the hardest 300 meters of an 800 and finish without getting immediately caught is pretty impressive. Some kids tried to cut the course in my high school cross country championships, which took place in a quarry with no supervision, and they still got caught and reprimanded on the spot. The Bandit appears to be a serial cheater with little respect for the rules of running, but he is at least truly bold in his transgressions, and crafty enough to have kept up with them.